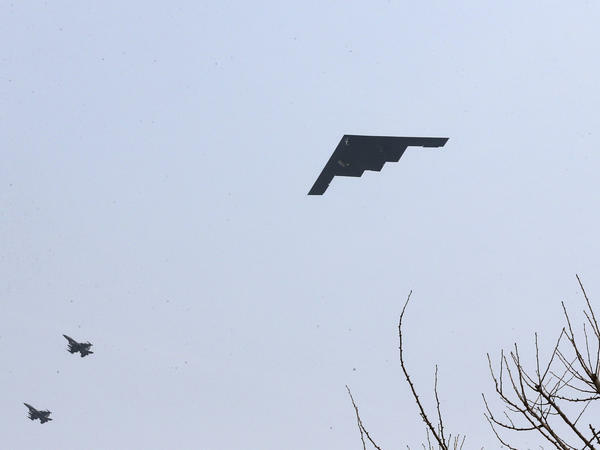 A U.S. Air Force B-2 stealth bomber flies near Osan U.S. Air Base in Pyeongtaek, south of Seoul, on Thursday. The U.S. military is making no secret about a training flight by a pair of nuclear-capable B-2 stealth bombers from a base in the American Midwest to the Korean Peninsula — what's being described as an "extended deterrence mission." The flight of the two radar-evading bombers "demonstrates the United States' ability to conduct long range, precision strikes quickly and at will," the United States Forces Korea said in a press release Thursday. The strategic bombers belonging to the 509th Bomb Wing took off Thursday from a base at Whiteman Air Force Base in Missouri and flew "more than 6,500 miles to the Korean Peninsula, dropping inert munitions on the Jik Do Range [in South Korea], and returning to the continental U.S. in a single, continuous mission," USFK said. It said the United States is "steadfast in its alliance commitment that the defense of the Republic of Korea, to deterring aggression, and to ensuring peace and stability in the region." The B-2 bomber is a vital element in that deterrence, according to the USFK release. The Associated Press says it's "unclear whether America's stealth bombers were used in past annual drills with South Korea, but this is the first time the military has announced their use." Drawing attention to the stealthy (and normally quiet) training mission is clearly meant as a signal to North Korea. It comes amid ongoing joint exercises between the U.S. and ally South Korea, and as Pyongyang has stepped up rhetoric — warning of a "simmering nuclear war" on the peninsula. "It keeps most of its key military installations underground and its war cries typically reach a frenetic pitch when American bombers fly over South Korea during military exercises. The resulting fear and anti-American sentiment is used by the regime to make its people rally behind Pyongyang's 'military-first' leadership." In response to B-2 stealth bombers mission today, North Korea's leader OKd a plan to prepare to launch an attack on the U.S.
"In a meeting with military leaders early Friday, Kim Jong Un 'said he has judged the time has come to settle accounts with the U.S. imperialists in view of the prevailing situation,' the state-run KCNA news agency reported. "'If they make a reckless provocation with huge strategic forces, [we] should mercilessly strike the U.S. mainland, their stronghold, their military bases in the operational theaters in the Pacific, including Hawaii and Guam, and those in South Korea,' KCNA reported." In a briefing earlier, Defense Secretary Chuck Hagel said the B-2 flyby was not intended as inflame tensions, instead it was meant to signal that "these provocations by the North are taken by us very seriously and we'll respond to that." "We don't have any choice in defending this country but to anticipate worst case scenarios," Hagel said, according to CBS News. "These are decision-making processes that evolve based on threats — you only need to be wrong once."